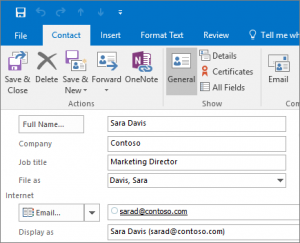 If you often email a group of people, create a contact group in Outlook so you only need to email that contact group instead of individual emails. Under the Contact Group tab, click Add Members and select From Outlook Contacts. the list below Address Book, and then select Contacts. Hold down the CTRL key as you select each email contact you want to add to the Contact Group. the File menu, click New Entry. Click the Members button to add those specific contacts as your group members and click OK. Enter a name for the group. after checking that you’ve got all the names and emails you want for your contact group. Click Save & Close under the Contact Group tab.